Our good friends recently celebrated their one-year wedding anniversary (yay!) This post is inspired by the wedding card Saira gave them (which is now hanging on their wall) which reads "'Til death do us part' is for quitters". Normally, we wouldn't equate skeletons with romance -- but the sentiment was just so romantic that we felt inspired! Plus, pink peonies and butterflies are certainly not for everyone, and your wedding day should really express your personal style. 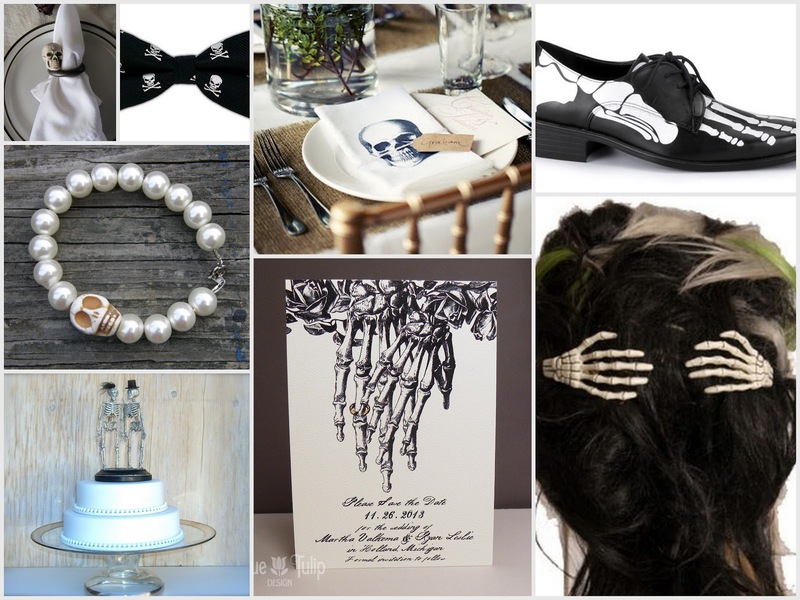 So if you are a bride who walks on the dark side, enjoys "goth" style, is an osteologist, or is in it for the long run, then a skull and bones wedding is just for you! Believe it or not, a skull and bones wedding can be pretty classy -- think a black and white ball, with some edge! You don't have to go overboard with this style, but throw in a few skeletal details and you'll have yourself a fun and interesting wedding theme that will keep your guests talking. Over a shirt is extremely comfortable and fits you good. The pockets are very convenient and i have already gotten plenty compliments on http://sheepskinjackets.webs.com as well. I appreciate Sheepskin Jackets UK design, cool collar, stylish zippers and nice pockets with zippers which is great for my phone and keys. Leather feels very soft, the stitching is good. Wow, all of this is so cool, I like those skull hand hair clips!